Pocket, formerly Read It Later, received an update on Android this morning that includes a new feature called “Listen.” This new feature allows for speech-to-text playback of your saved articles, in case you don’t feel like straining your eyes after a long day’s work. Thanks to the Android platform simplifying the process dramatically, the developers of Pocket were able to create this app during one of their “Friday hack days,” a short competition that their team does for fun. While using “Listen,” you can choose from a variety of languages that are installed on your device, fast forward or rewind the article, and even speed up or slow down the pace. Oh, we should also point out that this is an Android exclusive since iOS doesn’t have a text-to-speech API for developers to use. 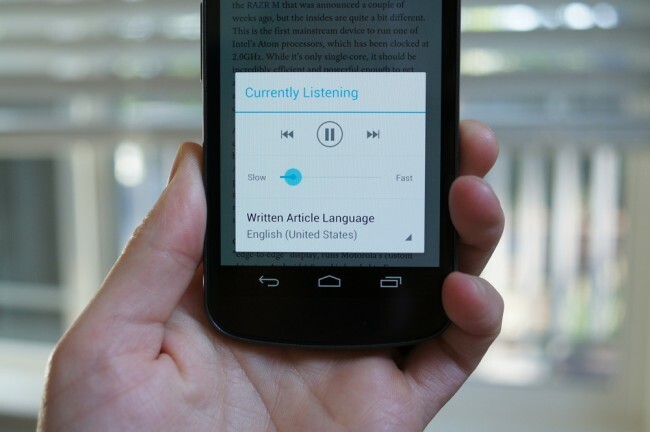 Twitter, Amazon MP3, and Foursquare Apps Receive Updates, Oh My!